Partnerships between academic and community stakeholders are essential implementation research. Given the complexity of this type of research and the landscape of social service delivery systems, engagement of various stakeholders at multiple levels is the norm. 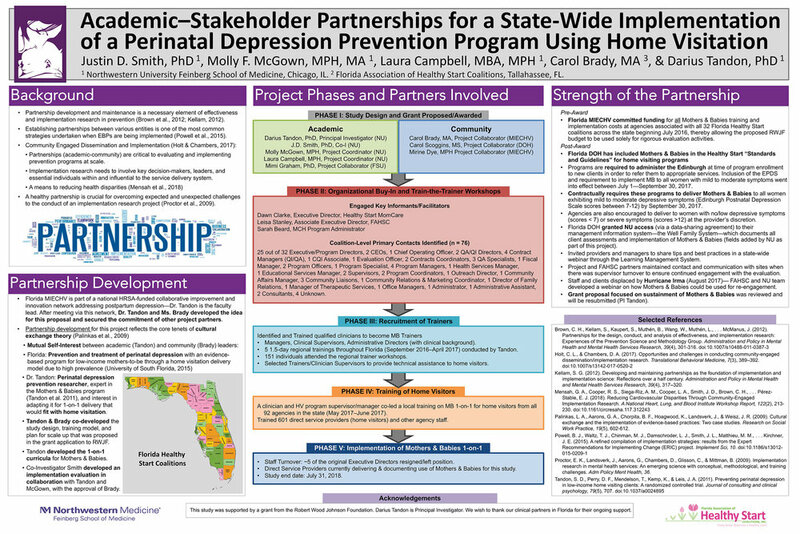 This poster describes the process of stakeholder engagement for a large-scale research project aimed at state-wide scale up of Mothers and Babies 1-on-1, an evidence-based perinatal depression prevention program, in home visitation (HV) via Healthy Start. The partnership includes an academic medical center (Northwestern University Feinberg School of Medicine; NUFSM), a state health department (Florida Department of Health; Florida DOH), and a statewide coalition of HV programs (Florida Association of Healthy Start Coalitions; FAHSC) and its various constituent stakeholders (e.g., clinical supervisors, home visitors). Florida DOH and FAHSC initiated the collaboration with NUFSM in 2014 given the mutual self-interest in better addressing perinatal depression given its prevalence among clients that receive HV services. The partnership was further made possible by the state’s desire to implement and evaluate an evidence-based preventive intervention and the academic partners’ expertise in such an intervention and ability to conduct a rigorous evaluation of both the effectiveness at reducing depression and the process and outcomes of implementation. As a result of this partnership, two major accomplishments have occurred. First, a hybrid effectiveness-implementation trial was funded (to be completed in Fall 2018). This itself required an additional partnership within NUFSM to join experts in the clinical intervention and in implementation research. Second, the Florida DOH has now integrated Mothers and Babies into its Standards and Guidelines for all HV programs throughout the state; specifically, these guidelines call for HV programs across all 33 Coalitions to deliver MB to—at minimum—all women exhibiting mild to moderate depressive symptoms. Partnership maintenance is promoted by monthly phone check-ins between NUFSM and FAHSC, bi-weekly project updates sent by NUFSM; and periodic in-person presentations by NUFSM to DOH and FAHSC leadership coinciding with state-wide meetings. This partnership recently resulted in the submission of a R01 to examine sustainment of Mothers and Babies across the Healthy Start network. A key variable promoting this ongoing partnership is the shared decision-making among NUFSM, DOH, and FAHSC. In addition, considerable time was spent at the onset of the project clearly delineating specific roles and responsibilities for all partners to facilitate joint ownership of the project. These are described in this poster.